St. Patrick’s Day party complete with temporary tattoos and custom drink coasters! Whether you are Irish for a day, or Irish for life, St. Patrick’s Day is the time to show your Irish pride. This March 17, how are you celebrating? Here is a list of 6 ways to celebrate one of our favorite holidays! Check out the world’s biggest St. Patrick’s Day Celebrations and find a parade near you. Not able to travel, no problem. Many smaller cities host St. Patrick’s Day festivities throughout the weekend. Get involved in your community and attend a local parade. Don’t forget to wear your St. Patrick’s Day temporary tattoos to show your Irish pride. Choose from shamrocks, rainbows, leprechauns, horseshoes and the Irish flag. Enjoy a cold, green, minty shake! Drink in some luck with McDonald’s Shamrock Shakes®. Available for only a limited time, you don’t want to miss your opportunity to get a Shamrock Shake® this year. Beginning in February and only available through the end of March, Shamrock Shakes® are now offered in numerous varieties. Don’t miss your opportunity to drink up this St. Patrick’s Day favorite. Go to your favorite Irish pub and indulge in a cold, green beer. What is better than a cold, green beer on St. Patrick’s Day? Designing your own custom drink coaster to bring along to share with your friends at the pub. Add hashtags, photos, funny phrases and more. The options are endless! Your friends will love your thoughtfulness and you can make a few new friends while passing them out at the pub! Celebrate St. Patrick’s Day by eating traditional Irish cuisine. Not a fan of corned beef and cabbage? Try one of these recipes recommended by The Food Network for St. Patrick’s Day. Other favorites include Irish stew, Shepherd’s pie and Irish soda bread. Decorate glasses, plates and bowls using temporary tattoos to make your dinner festive. Get your kids involved in a Leprechaun hunt to find a pot of gold! Pesky leprechauns are known to leave a mess! Encourage your kids to try and catch a leprechaun by following his trail. Leprechauns have been known to leave messes in homes and classrooms to make the holiday extra fun for kids. Leave a trail of shamrock temporary tattoos around the house that leads to a pot of gold, in hopes of catching that illusive leprechaun. Don’t get pinched! You definitely need to wear green to celebrate St. Patrick’s Day. From lime green to forest green, just make sure to wear green. Why green? 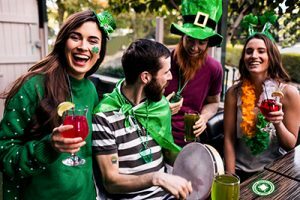 Because people have celebrated by wearing shamrocks and green ribbons, so naturally green became the color associated with the holiday. You can also enjoy a bowl of Lucky Charms, listen to a bagpipe performance or learn the Irish jig. St. Patrick’s Day is a fun holiday for everyone. 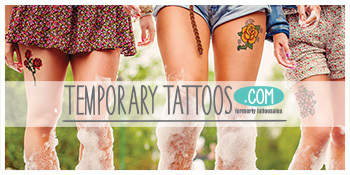 Make sure to get your green early this year and order your St. Patrick’s Day temporary tattoos. 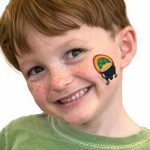 Provide temporary tattoos to your friends, family and children’s classmates, so no one gets pinched!